We will need to spice these guys up a bit and what goes better with lobster than butter? Nothing! So we should make some flavored butter to use right at the end of the cook. The butter will seep in and the spices will flavor the tails. Perfect! I made two butters just to vary things a bit. Melt the butter and mix the rub or garlic in and let it sit. This will need a good amount of time (30+ minutes) to set up and become more butter-like, so I prepared this before I prepped the Lobster Tails. It also helps if you set it in the refrigerator to set up. First you have to expose and rinse the meat. Using kitchen shears, I cut down the center of the tails toward the tip of the tail, cutting through each segment as you go. Next, run yo u finger around the meat to release it from the shell. Releasing the meat enables two thing: 1) you can get under the meat to rinse/clean it, 2) much easier eaten’! I initially just cut one line down the center, but I found it hard to get my fat fingers in there to release the meat without a bazillion tiny cuts on my digits… WARNING: those shells are SHARP! So, I modified the plan and cut a “groove” out of the shell to give me more room. I also think it u ps the presentation value! Now, no matter which cutting method you decide to use, go ahead and rinse the meat in cold water to get the little bits of shell and sea dirt out. This is also a good opportunity to de-vein the lobster, just like you would a shrimp. The last thing you need to do is skewer these guys! Lobster tails have a tendency to start to curl a bit when you cook ’em. 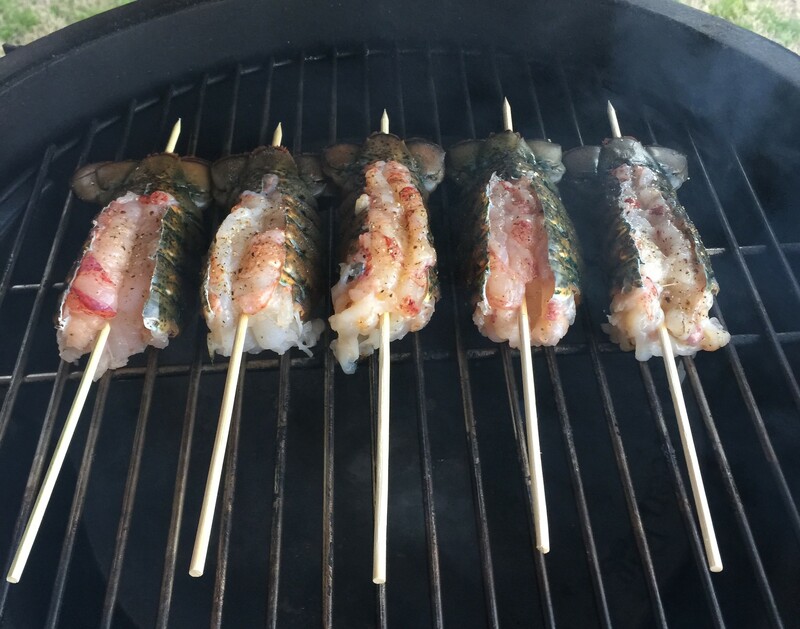 Skewer them right through the center of the meat and exit just under the tail. This will just keep them nice and straight so they stay pretty. After a little salt and pepper, we are ready for the smoker! Get your grilling/smoking apparatus up to 225-ish. Get the smoke going. I chose Apple flavored wood and used chips instead of chunks since the smoke time is shorter. This smoke should be around 30-45 minutes. I used a temp probe during the smoke so I didn’t overcook the lobster. I expected it to take longer due to the low temperature and indirect heat. But after about 30 mins I had reached 135 degrees. Lobster should be around the 135-140 degree mark. I used the finger test to make sure it was done (the meat should be firm to the touch and opaque, similar to the difference between an uncooked and cooked shrimp). I added a dollop of the “Fancy Butter” on top of each tail and let it sit in the smoker for another minute to let it seep into the meat. If I had planned better, timing-wise, I would have added the butter with about 10 minutes left to give it more time to soak in. Next time I will prepare better with an oven waiting on warm or possibly serve them as an appetizer! 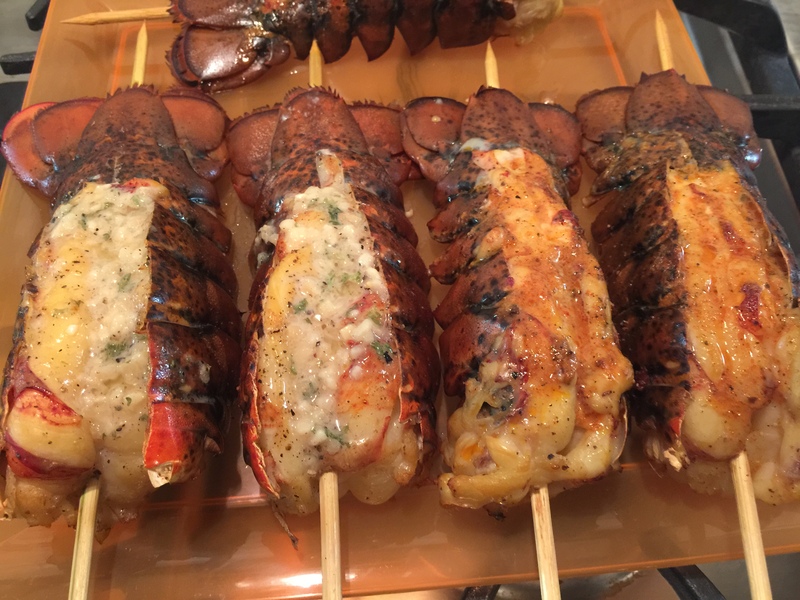 Have you ever smoked lobster tails? How did they turn out? Any tips you would like to share? Let us know in the comments!